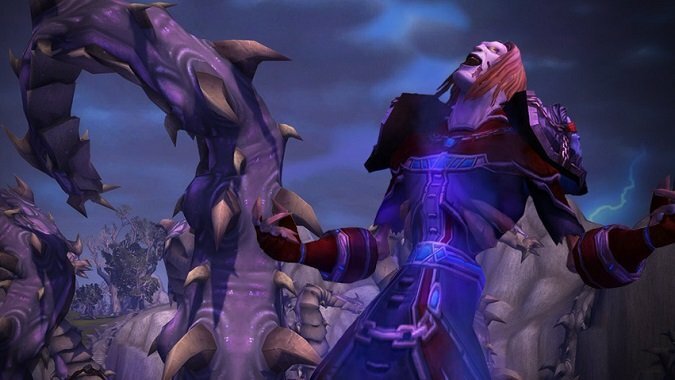 I’ve had a better, more thorough chance to play my Shadow Priest in the Battle for Azeroth test servers since we first took a look at the spell changes. Unfortunately, the time I’ve spent playing Shadow on the alpha and beta hasn’t exactly felt great. It’s not the worst thing in the world, mind you — but there are a lot of changes that have me scratching my head. 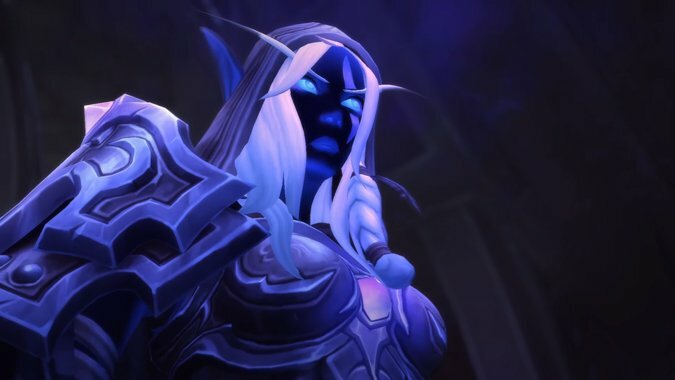 Today, I’m going to go over what’s feeling most problematic with Shadow Priests in Battle for Azeroth. Hopefully by the end, we can collectively come up with some solutions to make Shadow feel the best that it can. Shall we? Back in the Legion beta, Void Sphere was significantly bigger than it is now. Shadow has gone through — and will continue to go through — plenty of spell changes. I went over the initial changes a while back, and while not much has changed, there are a few important changes I want to go over quickly. 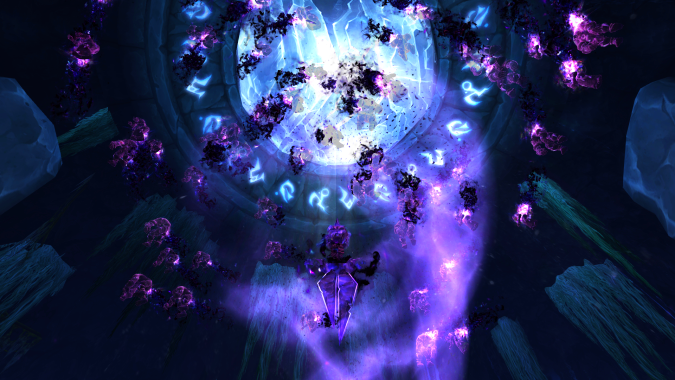 Mass Hysteria — In Legion, this effect from our Artifact weapon meant there was a reason to stay in Voidform for as long as possible. Dispersion — The healing effect, also from our Artifact, is gone. The spell now only serves as a 60% damage reduction and an Insanity-drain prevention. Talents — Some of these have swapped tiers and others have been used to fill in removed spells like Shadow Word: Death (which, unfortunately, shares a tier with Twist of Fate). Void Tendrils — Once again, another Artifact effect (Call to the Void) is gone. It’s less noticeable on gameplay than Mass Hysteria, but still an effect I’ll miss (if for anything but the visual). Sphere of Insanity — This is another one I’ve noticed less, but it’s closer to the vein of Mass Hysteria than that of Void Tendrils. It’s a passive damage increase during Voidform, though in this case, it helps taking down multiple enemies at once easier. Vampiric Touch and Shadow Word: Pain — Both of our DOTs last for a shorter duration, and Void Bolt adds less time to them than it does now. All in all, the changes mentioned above are the biggest sources of my gripes with Shadow in Battle for Azeroth. Individually, they may not be terrible — but they add up to a gameplay experience that feels like a step back from that of Legion’s. Because of the changes to our DOT duration and the refresh rate of Void Bolt, we’re having to re-cast DOTs far more often in Battle for Azeroth. I’ve often found that I need to refresh both of my DOTs at about 50% mob health while leveling. While not inherently bad or even too noticeable at first, this becomes far more troubling when you pull more than one enemy. In fact, pulling even three enemies leads to only getting off a couple filler spells before hitting that 50% health mark. What follows is a series of re-casting DOTs, healing yourself, and trying to fit in a Mind Blast before you need to either re-cast or heal again. Additionally, while Voidform is still a core component of gameplay, it feels far less impactful than it has in Legion. A large part of this is due to the removal of Mass Hysteria, which rewarded us quite handsomely for maximizing our time in Voidform. The removal of Mass Hysteria combined with the nerf to Voidform’s Haste bonus and DOT-refresh duration means some of the best damage you can get out of Voidform comes from Void Eruption itself. And with that being the case, it hardly feels necessary to maintain Voidform as scrupulously. Oh, and speaking of Void Eruption, the way it hits targets now is proximity-based, in a radius around your primary target. While this at first might seem like a good thing — no longer needing to DOT everything in a pack to hit them with Void Eruption — it’s actually kind of a pain. 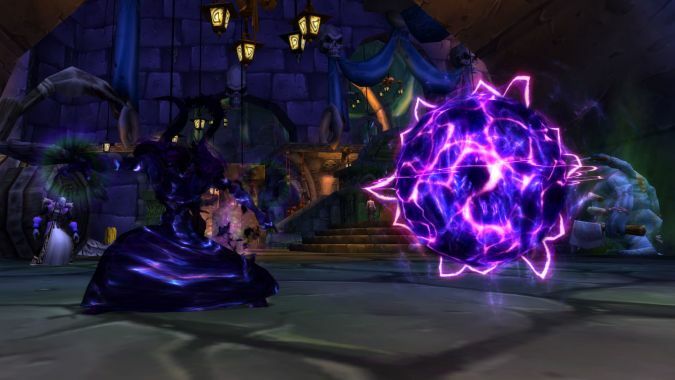 The new Void Eruption feels almost as though it’s taken the place of the passive Mind Sear. More often than not, I’ve found myself using Void Eruption on one specific enemy, only to wind up realizing that enemy’s friend was a lot closer than I thought. Oops! I just pulled more mobs than I can handle. Conversely, the old method of hitting anything with a DOT on it worked very nicely, either for mobs that would run away or for casters that refused to group up. Simply DOT them, use Void Eruption, and watch the Void soar through the air toward each target. Now, it doesn’t matter if 10 enemies have DOTs on them — if they’re not close to your primary target, Void Eruption doesn’t do anything to them. Oh, and did I mention the best part? If your target dies while casting Void Eruption, you need to pick a new target and hope it doesn’t also die before you finish your cast. This is especially fun in dungeons when you don’t have as much control over when mobs die. If you’re wondering how the global cooldown changes have affected us, well… they haven’t. Not much, anyhow. 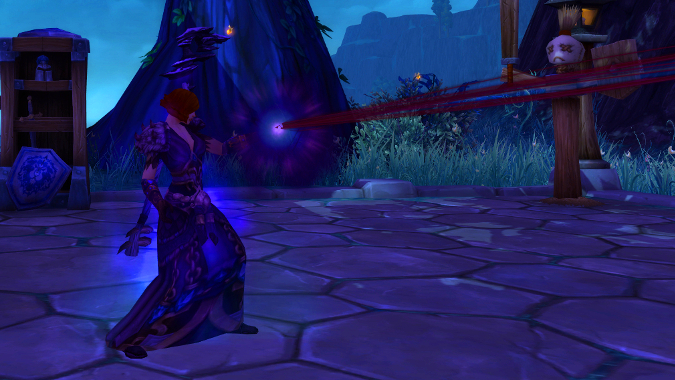 Vampiric Embrace — and, before it was removed, Power Infusion — is the only ability in our kit that’s now on the GCD. This is, admittedly, rather frustrating when you’re used to popping it immediately before a big-hit spell goes out, but it’s not the end of the world. It takes a bit of adjusting to get used to, and its inclusion on the GCD feels unnecessary, but given all my other concerns, this one’s pretty low on my list. One of the frequent complaints I saw from Shadow Priests — especially at the beginning of Legion — was that they died all the time. I admit I didn’t encounter this as much as others — though Suramar definitely felt less forgiving than anything prior. However, Battle for Azeroth thus far seems worse for survivability than Legion ever did. Some of this is due to the DOT changes I mentioned above. Having to re-cast DOTs multiple times on just one enemy means pulling more than one enemy is even worse. Again, it fast becomes a game of maintaining DOTs while trying to heal yourself with a paltry Shadow Mend here and there. Yes, we do have Mind Sear back, but it rarely feels like a spell meant for solo play. It may work better in dungeons or against “minor” mobs, but fans of multi-DOTing are better off avoiding it, in my experience. Part of this has to do with the changes made to Mind Bomb. Rather than stun everything, it causes a Terrify effect — one that can be broken early by damage. Where before, Mind Bomb gave you a window to gain some distance and get some spells casts off, it’s now unpredictable and may have little to no effect unless your only goal is to run away. Given this sort of change is happening to more than just Shadow Priests, I’m willing to look past it. The real issue is Dispersion. I’m not sure if any of you were around when Dispersion was first introduced to the game, but it was a 51-point talent. And it was paltry compared to other 51-point talents. It reduced damage and restored mana, but it didn’t result in any damage gain whatsoever. In some instances, it was better to just not take our final-tier talent. It reduces damage taken by 60% and prevents Insanity drain. But because we’ve lost our Artifact, it no longer heals during that window. And because of the scaling changes, that 60% damage reduction rarely results in anything more than a slightly delayed death. It’s about as close to useless as you can get without just plain not existing. If it wasn’t obvious from everything I said above, Dispersion needs to be buffed. I’ve always been a fan of providing some sort of damage buff after it expires to offset the DPS lost, but as it stands, that DPS buff would do no good because you’d probably be close to dead anyhow. Dispersion needs to either absorb more damage or regain its healing component. Barring that, remove the entire spell and save us the action-bar space. As for our offensive abilities, the simplest solution is probably the most obvious one: Revert the changes to DOT duration. If a full-on revert is too much to ask for, meet us in the middle. I understand never thinking about DOTs isn’t the way a DOT-based class should play, but the amount of time spent refreshing DOTs — especially if we pull more than one target — is too high, and frankly, not fun or engaging. It’s important to remember that the numbers portion of all this will change. At least, it should — Yogg knows it needs to. Part of low survivability is certainly due to the fact that I’m just not killing things very fast. But most of the issues I’ve discussed today have nothing to do with numbers. They’re all about how the spec feels. The basic rotation feels off, the payoff for Dispering feels negligible, staying in Voidform doesn’t feel worthwhile, and so forth. Truthfully, the adjustments to Shadow feel like change for change’s sake. I can’t really discern what Blizzard intends Shadow to feel like with these changes, nor can I discern why they’d feel these changes improve the spec. I realize they’ve said class design is mostly finished, but I sincerely hope they re-open their case on Shadow. If not, I expect several players will migrate to a spec that feels more enjoyable.